The apartment Tihana with the ground-plan of 80 square metres, for 4-6 adult people ,is located 100m away from the sea on the Northern side of the bay. 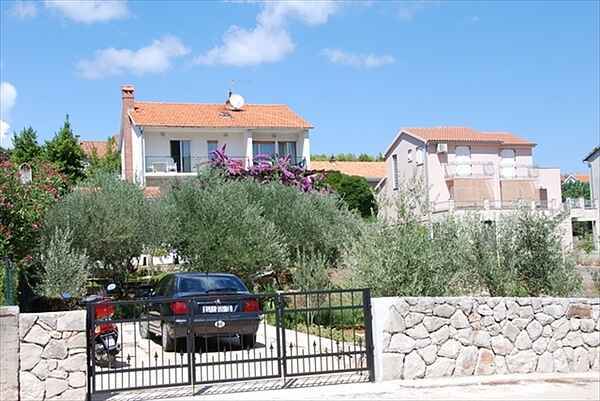 It is situated at the same distance from the sports centre ( tennis courts, volley- ball playground, golf -course, football and basketball playgrounds, hotel swimming pools, nice beaches and 300m from the town centre. There is a grocery shop, pharmacy and the first- aid station close by (200m). Around our house there is a garden 1100m large. The apartment consists of 4 rooms: Three spacious bedrooms, modern well equipped kitchen, living room with an extra double - bedded sofa and a modern bathroom with shower. All the rooms have balconies and air - conditioning. There is also a coffee appliance, a large refrigerator with freezer, electric stove, electric and gas cooker, TV sets with satellite programs, hi-fi,dvd,wi-fi, fire-place available. Separate entrance with parking, garden furniture with fireplace. Two bicycles available for guests.